One of the best new plants out in 2000 has to be this. This new persicaria has bright red fleshy stems that arch up to 36”, growing into a 5-6’ wide mound. Each stem is covered with leaves that have a stunning pattern of dark purple/ burgundy and mint green with silver chevrons running down the middle of each. Each clump is covered with sprays of white baby’s-breath like flowers throughout the summer. This is a non-invasive form which will do well in the perennial border or look fantastic in combination planters. Persicaria microcephala “Red Dragon” is a fast grower and will soon fill out a good sized container. It is hardy from zones 4-9. 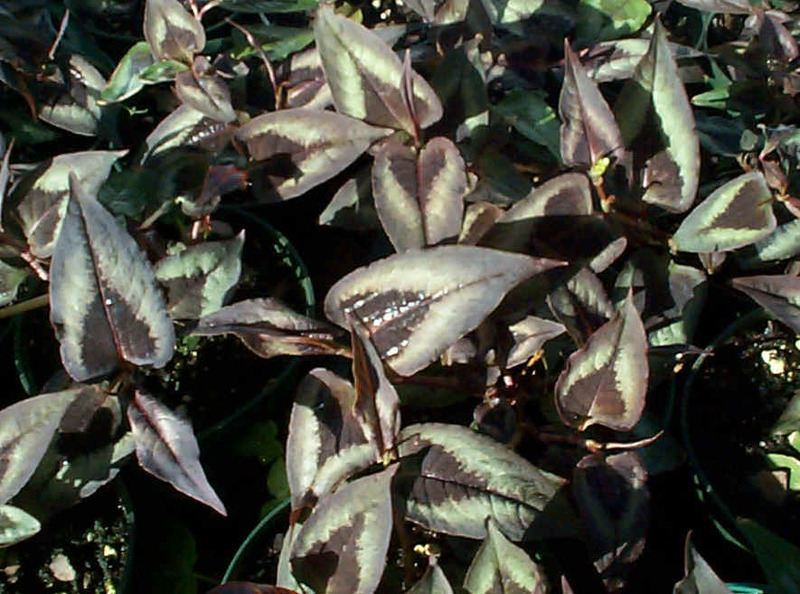 It prefers a moist soil and good sun but is quite adaptable. In 2001, we are taking another look at this plant. Over the winter, I saw a lot of loss in the plants I over-wintered in containers. I am waiting to see how the ones I have planted in the ground have fared. This would still make a nice annual to grow in mix containers or by itself. It may not be as hardy as first believed. 8/22/2001 All right, I am very satisfied with this plant. The ones I have planted in the ground have all come back very nicely. They have formed nice plants flowering now. The container plants suffered a lot a damage and were very slow to come back. Even in the ground, this was slow to come up in the spring but is definitely in good growth now. I like... I Like!! 5/7/2002 A New Jersey perennial, this is and fine one at that. Use as an annual in containers( and be pleasantly surprised if it comes back) or use as a great plant in the perennial garden.